Today we visited the Polynesian Cultural Center (PCC) in Laie. 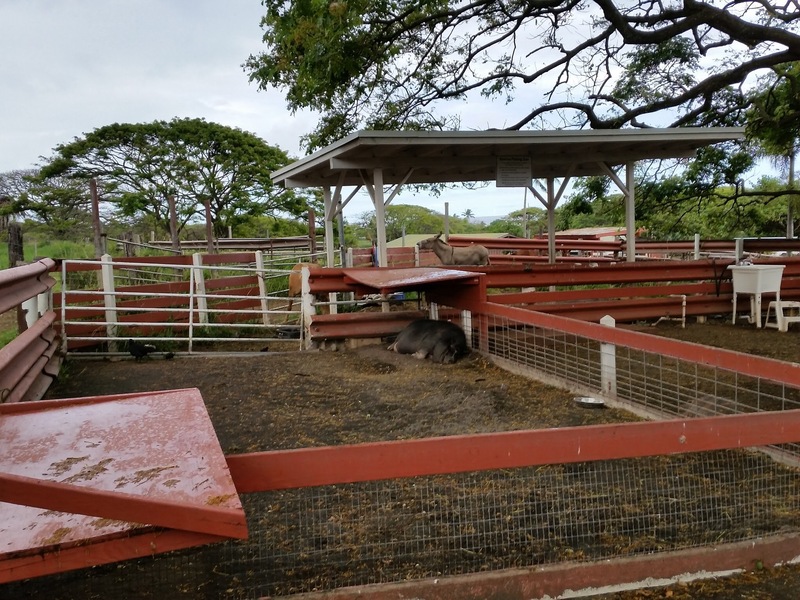 This is the most visited attraction in Hawai’i and it has an interesting story. Laie is the Pacific headquarters for the Church of Jesus Christ of Latter Day Saints. There is a branch of Brigham Young University in Laie and owns/runs the PCC. I booked tickets for us to visit the Polynesian villages with activities, the Luau dinner and the evening show, Ha: The Breath of Life. We arrived just as the Canoe Parade started. Each nation had a double-hulled canoe with people in traditional costume dancing. It was brilliant. From here we moved on to visiting some of the villages starting with Samoa. The sun was out and it was warm! We had to have a traditional Hawaiian snack, shaved ice. We continued through some of the other villages and tried some activities. We all tried weaving with coconut palm leaves, tasting coconut bread, and waited to take a canoe ride but it was taking forever. We needed to check in for our luau dinner so the last bit of our visit was rushed. If you come to the PCC it really is a good idea to come at 12 when it opens. We didn’t think there would be enough to fill our time but there definitely was. Upon arrival to our luau dinner we had our photo taken and got souvenir necklaces. We were seated right in the middle with good views to the stage and close to the buffet. The sheer number of people in there made me wonder how they were going to manage so many people and a buffet. I was pleasantly surprised at how orderly everything went. It was set up so well that there was little waiting and no chaos. All of us tried new foods. Taro rolls, poi, poke, bbq pork cooked in an underground pit, salad, teriyaki beef, sweet potato salad, fish….the list goes on and on. There were several dessert options as well: chocolate cake, pineapple bars, guava cake, bread pudding made with taro bread. The luau show was excellent as well. I haven’t seen Alex so serious or concentrate on anything for so long. He was mesmerised. After the kids tired of the show we took our extraneous things back to the car and pick up our light jackets before the 7:30 show in the Pacific Theatre. We walked back over to the marketplace area near the theatre. The kids had a great time chasing bubbles and learning traditional poi twirling. At 7:20 we went to find our seats. When we checked in at the box office we changed our seats to a different area so we could sit on the end in case we needed to get out for some reason (bloody nose, toilet, etc). Our seats were ok considering we purchased mid-tier tickets.as we were settling in an employee came up to me and whispered to all get up, make our way through the portal closest to,U.S. And go back around to the next one. In a bit of confusion we did as he said. Lucky us, he moved us to front row seats. Awesome views. So grateful. Ha: The Breath of Life blew us away. Really awesome. The dancers were spectacular and so professional from facial expressions to little nods of their heads. All in synch with each other, truly impressive! No cameras were allowed at the show so I can’t share any photos. At the end the dancers/actors all came out to shake hands with the audience and thank them for coming to the show. I would definitely go back to PCC again! The weather has been cooler than I expected here on Oahu. Lovely breezes and a bit overcast but pleasant. Tom’s flight landed at 11:30 today. We had to stop for fuel and then drive about 45 minutes to the Honolulu Airport. We ended up circling a few times but Tom got out of the airport quickly and was waiting on our third circle. Because Waikiki was overrun during Memorial Day weekend we skipped the aquarium. Because we were in the area we promised the kids we could go since we were close. We scored a parking spot in the tiny car park in front of the aquarium which is quite miraculous. As we approached the door a man handed Tom free passes for the kids. Score. We checked out the outdoor exhibits and then headed inside. Alex had the handheld tour guide and he wanted to stop at every display so we could listen to the information. It was cute the first five times. He eventually grew bored with it. After we checked out the indoor tanks the seal show started. The aquarium has two Monk Seaks that can not be released into the wild. So much fun for the kids to see. Because lunch was long passed we made a McDonalds stop after the aquarium. The weather had made a turn for the worse so the lovely drive we were going to do up the coast wasn’t going to work. We went back to the house and Tom had a little sleep. Once he was coherent we took him down to the beach a few houses down from our rental house for some wading, collecting of nature and time with the kids. 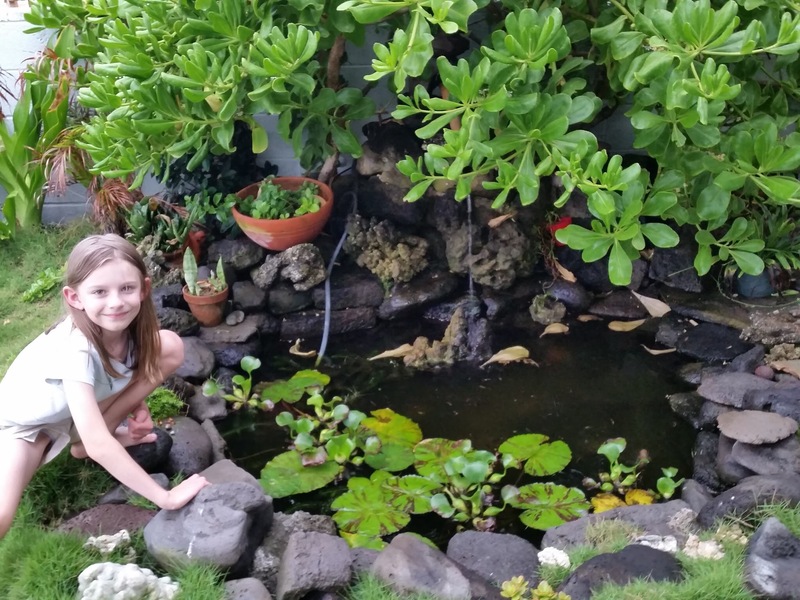 Sofia and the magical fish pond she loves so much. Sofia has been in charge of the fish pond since we have been at the house. The fish need to be fed twice a day. She also keeps tabs on the frogs and snails. She is truly in her element. There are also crabs living on the edge of the property that she checks on all the time. We haven’t had any luck with fish in the ocean in front of the property but I think the water may be a bit too rough. We took the 15 minute drive up to the ranch and collected our tickets. By now the rain was coming down and I wondered how this was going to go in the rain. It turned out to be ok. It rained for only part of the tour and then picked up again once we were done. The guides loaded about 24 or so of us into three Swiss Pinzgauers for our tour. Our guide took us all around the ranch on dirt roads, up and down hills stopping every now and again to explain Hawaiian Gods, taro plants, the islands, ancient fishing pond, etc. 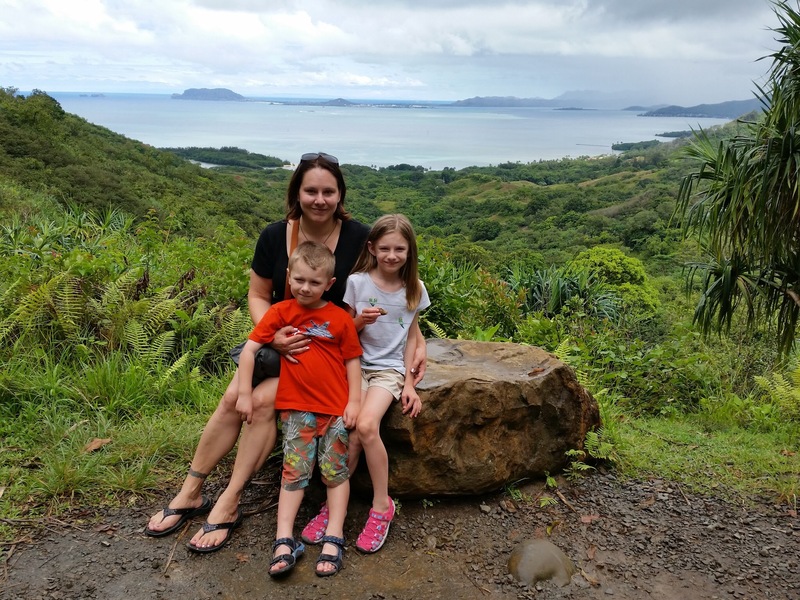 there were two amazing viewpoints over Mokoli’i Island and Kāne’ohe Bay. During our stops Sofia and I made sure to check out vegetation and ask questions about animals we saw or other things along the way. The guides were very knowledgable and were very happy to answer questions. Because of the rain we didn’t spend much time exploring the area. 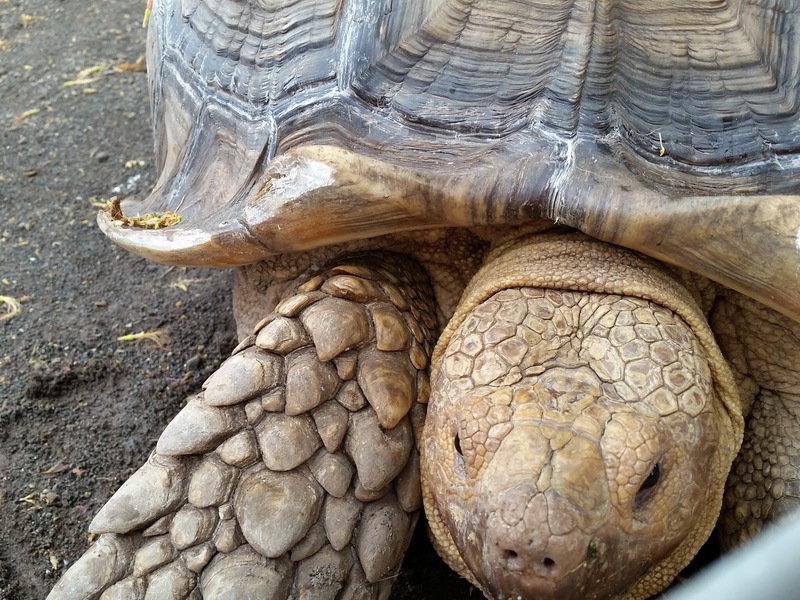 An obligatory stop was the petting zoo to see the turtles, pig, goats, horses, etc. From here it was a grand tour around the gift shop to pick up a few things. I got a dress, Sofia a shirt and Alex a Hawaiian shirt and shorts. The kids also got gummy bears for their classrooms and a few more miscellaneous items. Tomorrow we need to drive down to pick up Tom at the airport in Honolulu after his jaunt over to Los Angeles to see U2 for two nights with a friend. Tonight I read a book and the kids worked on their school journals. Only a few more days to home…. After a quick breakfast the kids asked to play Monopoly again. It took us a couple of hours before we called Alex the winner and put everything away. 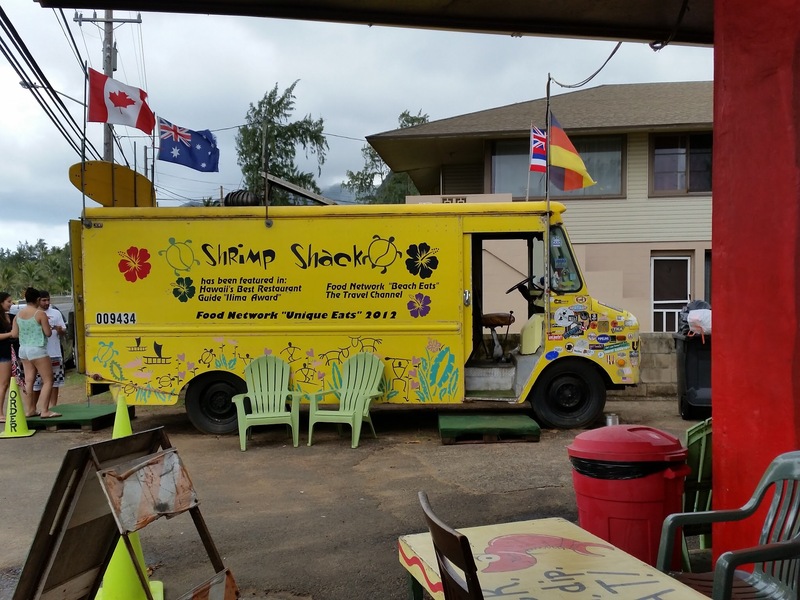 Today our mission is to find a beach on the North Shore to explore and then drive back to the famous Shrimp Shack for some dinner. We got ourselves ready for the day and did some laundry and then got in the car for an explore. The guidebook made Sunset Beach sound like a nice place for us to stop for a while. It wasn’t too far away and there were very few people there. The kids hadn’t quite committed to swimming or getting wet yet. They ran around and played for a while and got everything wet! Time to put on the cozzies and get in the water. One problem. The waves were a big too much for the little ones. They did love waiting for them to come in the then running. I went up to the car and changed into mine so I could get in the water with them. It was good fun but difficult as an adult not to be knocked down by waves or swept back in. I went in a bit further past the break and sort of bobbed along with the waves but they were too strong and kept pushing me back in. No wonder the North Shore is famous for surfing the big waves. We bundled up and got back in the car. Speed limits are notoriously slow here. It took us a while to get back over by our house and down to The Shrimp Shack. We got there at 5:07…seven minutes after they shut for the day! Oh well, back to the house. The kids had a bath while I prepared something to eat. After dinner they watched some shows on the iPad before we got ready for bed. 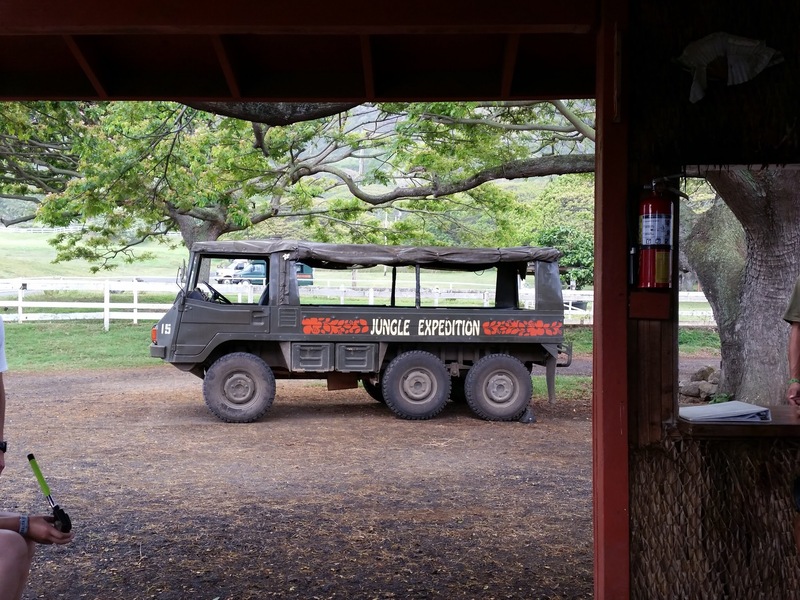 Wednesday I have planned to take the kids up to Kualoa Ranch for a jungle expedition in a Pinzgauer. Should be a good time. Lazy morning. Tom started teaching the kids to play Monopoly which took some time! Around lunchtime we took the trek back down to the airport in Honolulu for Tom to fly to Los Angeles until Thursday. Traffic wasn’t too bad for Memorial Day until we neared a large cemetery which had police directing traffic in and out. We said our goodbyes to Tom and went on our way. It took about an hour to get back up to the house. After a late lunch the kids wanted to go to the local beach only a few doors down from us. It turned out to be a good time. A dog kept us entertained for a good hour, Sofia especially. The dog loved us throwing the ball over and over and over again. Because it was late afternoon, breezy and cloudy it felt a bit cool out in the air. That meant the after felt toasty warm. It was hard to get out. After spending a couple of hours at the beach we came home and rinsed off. I didn’t feel like cooking so the kids wanted tacos from North Shore tacos again. Happy to oblige. This time Sofia had two tacos with beans and rice herself and Alex only managed half a taco. From here we popped into Longs Drugs next door to pick up a few things like motion sickness tablets, nasal spray to stop nosebleeds, etc. Another relaxing evening before playing musical beds again. Both kids ended up in the spare bed together because they didn’t want to sleep in different rooms. Sleeping is getting better. We should be well adjusted about the time we need to go home and start over again! There are so many things to do with the kids on Oahu but I know much of it is touristy stuff and not quite authentic. I struggle with booking these things and spending the money or do we just do everyday things we all love like going to the beach? Another night of messed up sleeping. Kids didn’t roll out of bed until 10 again. I think they had a better night of sleeping though. While they were still asleep I went through the room and got most of our things packed up into bags. For the next week we are staying at Hau’ula up on the Windward coast (NE of island) in a beach house. The kids had their heart set on swimming in the pool one last time before departing the hotel but there was no time since we had to be out before noon. We packed up the car and set off. Another glorious day with a million people everywhere. After a drive past Diamond Head crater we planned to stop at Hanauma Bay for the incredible snorkelling. Nope. You couldn’t even get in there because it was too full! We continued up the coast and arrived at the house 2ish. After checking out the fish pond, hammock, and views and getting our bags up it was time for food. Only a couple of miles up the road is the famous North Shore Tacos. The kids actually ate something different. Yay. After eating we popped into the market next door for some necessities for the week. The market turned out to be a very interesting adventure. There is unbelievable diversity in types of food here. There may not be a huge selection but I know I can get kimchi, chicken feet, octopus, pigs ears, and so on. Back to the house to settle in. I finished washing and drying all of our dirty and new clothes. Tom needed to work on packing a few things since Monday he is flying to Los Angeles to meet a friend for two nights of U2 shows.much of the evening was spent relaxing and hanging out and getting the kids much needed showers. Alex played musical beds again. He was meant to sleep in the top bunk bed but got out probably six times. Then he went to sleep in between us but then Tom couldn’t turn over because Alex was snuggled up. I ended up putting him in the spare bed by himself. Kids! Tomorrow we will drive Tom down to the Honolulu airport for an afternoon flight and pick him up again on Thursday.